The eighth generation of video game consoles seems to be all about handling pretty visuals and graphics of the latest video games, but among other things, all those pixels in the latest console releases require heavy storage. Both the PS4 and Xbox One consoles currently come with 500GB HDD on board, which is clearly not enough keeping in mind the enormous install sizes of nearly all major tipple A titles. Millions of gamers have demanded a new PS4 bundle with increased HDD size since the console’s launch, and now, it appears that Sony is finally preparing to launch a new PS4 SKU with 1TB HDD size this fall. Sony’s PS4 console currently offers only 407GB of available disk space out of total 500GB HDD space, and looking at next-gen games’ install sizes such as The Last of Us Remastered that requires whopping 50GB of available space, it is clear that the current storage space is not anything near enough. However, it looks like it won’t be long before gamers looking to buy Sony’s PS4 console will be able to choose between 500GB and 1TB SKUs, as some recent reports suggest that the platform holder is preparing a new 1TB PS4 model for release. The report was originally published by PS4Daily, which claimed to have had a little chat with an unnamed retailer source, and the source uncovered the fact that they have received a new model number under the console name “PLAYSTATION 4,” and a Q4 2014 release date. The new model number is said to be CUH-1001X, instead of the current one which is CUH-1001A. The source also mentioned that the main difference would be the in the harddrive, which will be double in capacity in this new upcoming model. According to the report, the “X” in the new CUH-1001X model number represents the HDD size in the PS4 console, and it is apparently just a placeholder. The final model number will be most possibly revealed during FCC certification in the US, because a few months ago, Sony added a new model which was revealed during the FCC certification process. 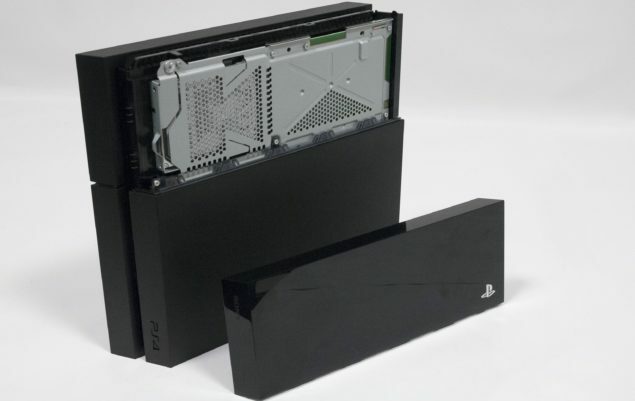 That model brought no changes to the PS4 console other than a new WiFi module with an improved antenna, but it is expected that the upcoming leaked model would bring a change to the HDD of the console. Now it would not be very surprising if Sony reveals a new PS4 SKU with 1TB HDD, knowing that this is exactly what gamers have been demanding. The Japanese platform holder previously reported that they have already managed to cut the manufacturing cost of the console, and that they have also increased their profit expectations. So looking at the situation, there is a possibility that Sony is planning to replace the current PS4 500GB console that sells at $399 with a new model that will come with 1TB HDD. If not, the platform holder might just release some new attractive 1TB PS4 bundle with one or two games for a bit inflated price.